Today was a wonderful horrible day. An eclipse day. There was a partial eclipse of the sun. In Fife it was about 95% coverage, which is still not total but impressive. It was expected to be cloud covered by the day dawned clear. And it stayed clear. Even though as I drove in to St Andrews, the town looked cloud covered. But by the time I got there, the sun was out (though partially covered). It stayed out throughout. 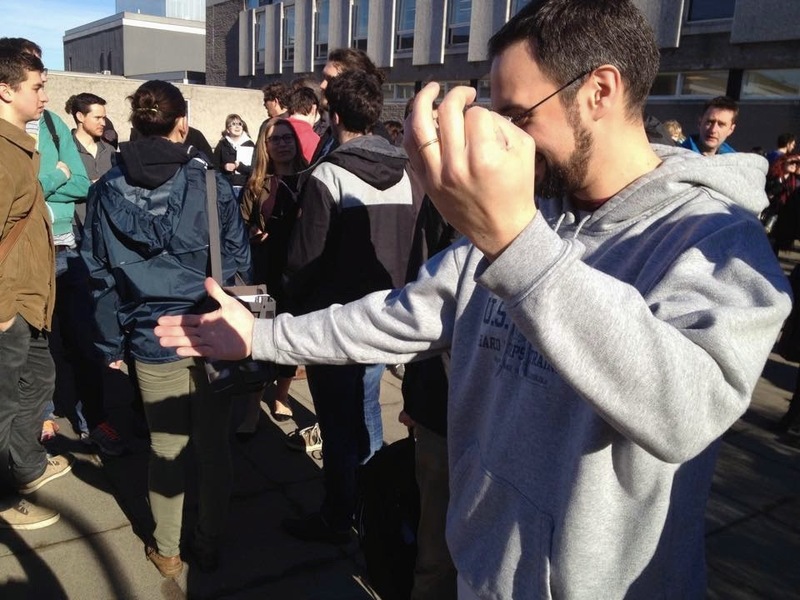 There was a gathering outside our Physics and Astronomy department, and although I had not been able to bring a pair of eclipse glasses, there was lots of ways to see the eclipse. I've got pictures here of two that I was particularly pleased with. 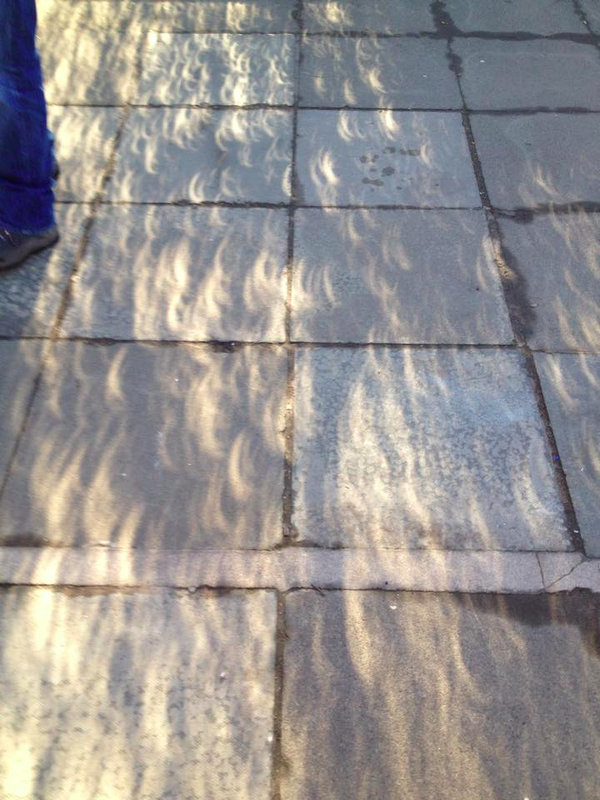 One is of hundreds of images of the eclipsed sun formed by gaps in a bush the sun was shining through. I've seen this before (in Sitges, Spain, in 2005) and knew to look out for it. Most people missed it, except some cognoscenti and some people we told. The other was nothing to do with me, but the picture shows somebody who knew just what to do. Making a pinhole with one hand he stretched his other out to capture the image. It's not very clear at this magnification but indeed there were two separate and very clear images of the eclipse on his hand. This is as low-tech an eclipse viewer as you could get: anybody (non-disabled) in human history could have done it during an eclipse! Then I went to work and really had a pretty good day. I had a few nice chats with people, about work and non work things. I continued a work chat from yesterday and made some progress with it, having a small but cute idea with my colleague. I talked to his PhD student and found out what he's been doing and found out that indeed it does look very good: I'd kind of missed this because a lot of it happened while I was off ill. Also it suggested a way we could approach a problem. I actually managed to start work again on a paper I've not been working on, but which I should have been. I didn't make a lot of progress but it was good to do something instead of nothing. I had one long chat which I was deeply touched to be involved in. As I was packing up to go home I realised I'd had as good a day at work as one could reasonably imagine. And I was more or less miserable pretty much all day. No special reason that I know about. If I remember to do so I can call days like this an "eclipse day". As a memory of this wonderful horrible day, and because of analogy of there being a bright sun but also 95% darkness.